Free Shipping Included! 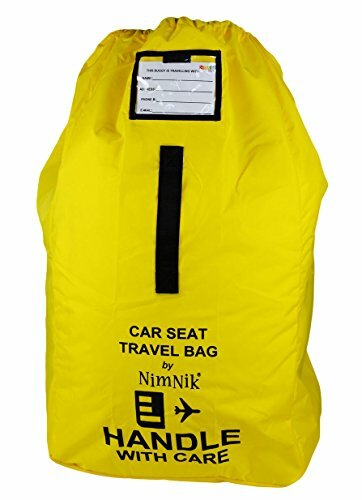 Car Seat Travel Bag - Ultra Rugged Ballistic Nylon, Best for Airport Gate Check In Bag for Car Seat Comfortable Padded Shoulder Strap And Carry Handle, Yellow by NimNik at My Pregnancy Place. MPN: 4327964483. Hurry! Limited time offer. Offer valid only while supplies last. FLASH SALE Do you just not have enough hands to carry everything? Are you tired of your infant car seat bag getting ripped or torn after one flight? Your search for the perfect car seat travel bag has ended! Our car seat bag is backpack style to PROTECT your baby infant carriers and booster seats clean, dry and bacteria free. It can also hold blankets, toys, and many other items. Made of extremely high quality and supremely durable ballistic nylon. This maximizes its lifespan and promises to give you the best value for your money! Ergonomically designed straps allow for carrying it as a backpack. Alternatively, you can also use it as a carry bag thanks to the durable front handle! Rest assured you will never lose it, thanks to its bright YELLOW colour and the cleverly designed ID card pocket. Simply write your contact details in there and amplify your chances to find it if it ever gets lost! Use the coupon to get the SPECIAL LIMITED TIME DISCOUNT and add two to your cart, one for you and one for a friend. ✅ NIMNIK LIFETIME SATISFACTION GUARANTEE - Take our ultra tough car seat travel bag in the airplane for a test flight on your travels. If any problems arise with our product you are backed by our 30 DAYS MONEY-BACK POLICY, we'll give you back your money-no questions asked. If you have any questions about this product by NimNik, contact us by completing and submitting the form below. If you are looking for a specif part number, please include it with your message.